It's really hard to find time to blog during the day with a little one. I'm thinking that from now on I will have to get my posts ready during the middle of the night and have them scheduled for late morning. The weather has warmed up about 20 degrees this last week so even though we took these pictures in the snow I wasn't cold until about the end. I always wear leggings with a dress or baggy shirt to cover my bum. I like my clothes to be nursing friendly so I generally look for a button up, swoop neck, or baggy shirt I can slip Zaden under. Sugarlips recently sent me this gorgeous lace dress and it was the perfect outfit to wear out on our family date! Last but not least no mama should go throughout winter without a cute pair of booties! This pair is from Lulus.com. yep, that fringe at the bottom of the dress is gorgeous and i love it. I love that lace dress! And your little baby is so adorable! They grow up way too fast! My son is two already and everyday I swear he grows several inches! 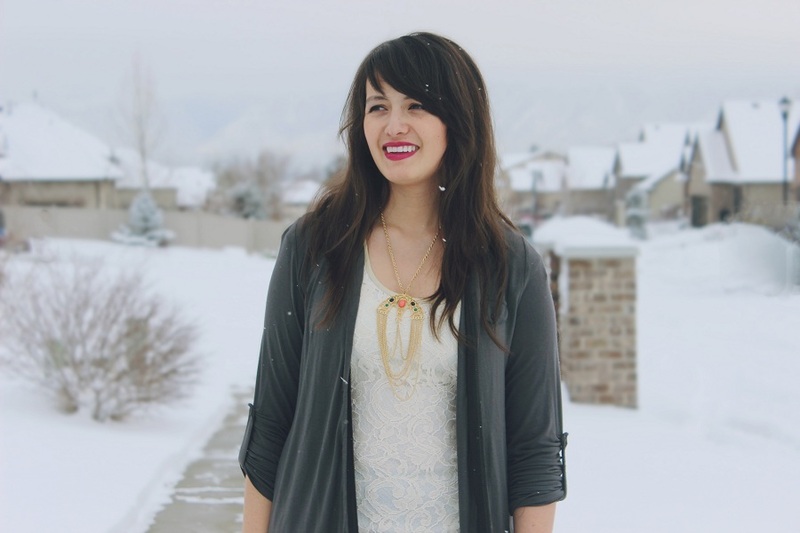 I'm also a Mormon fashion blogger living in salt lake so it was a fun surprise to stumble upon your blog! Can't wait to read more!!! that necklace is so unique! 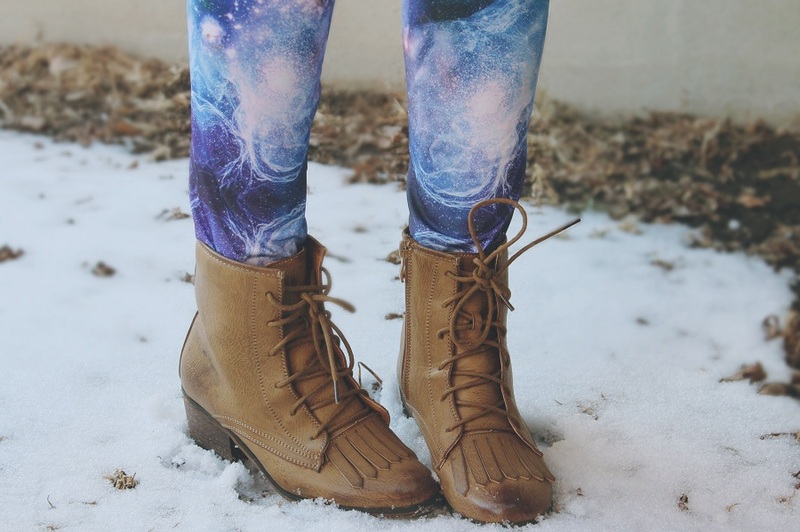 I am so jealous of that leggings find! 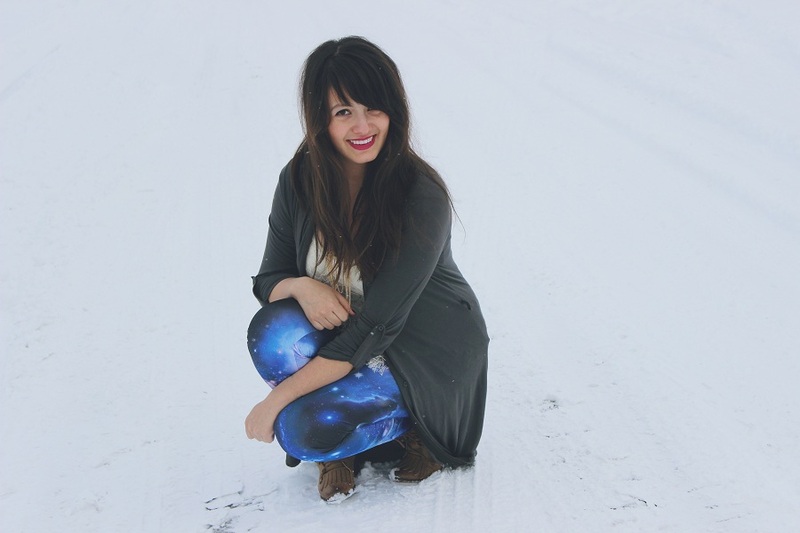 I have wanted galaxy leggings forever but they are so expensive where ever I find them! PS I love that last picture of you. Too cute. I LOVE the leggings! And you are so pretty! Cute dress and nice lip color! I love this outfit, you look really lovely. Looking like a pretty mama! I love that lip color on you! 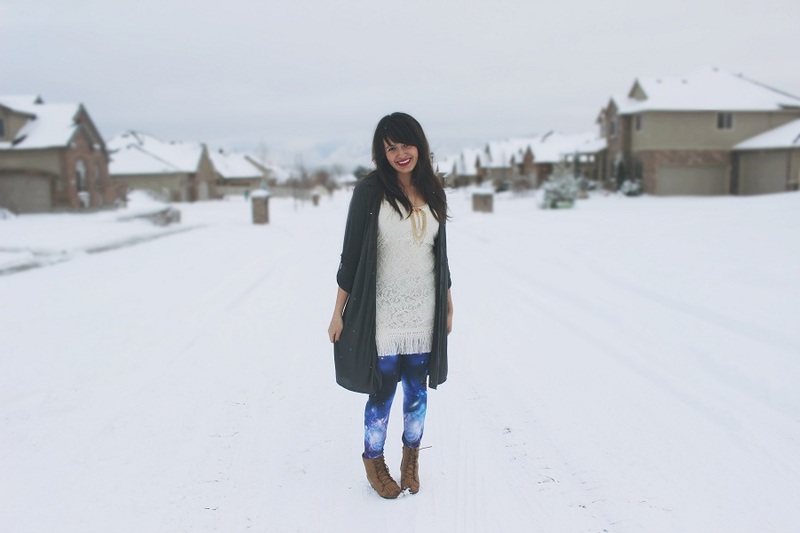 I live the galaxy leggings, im behind on that trend I need to get me some! And that lace dress is so pretty dressed up or down! I love it! 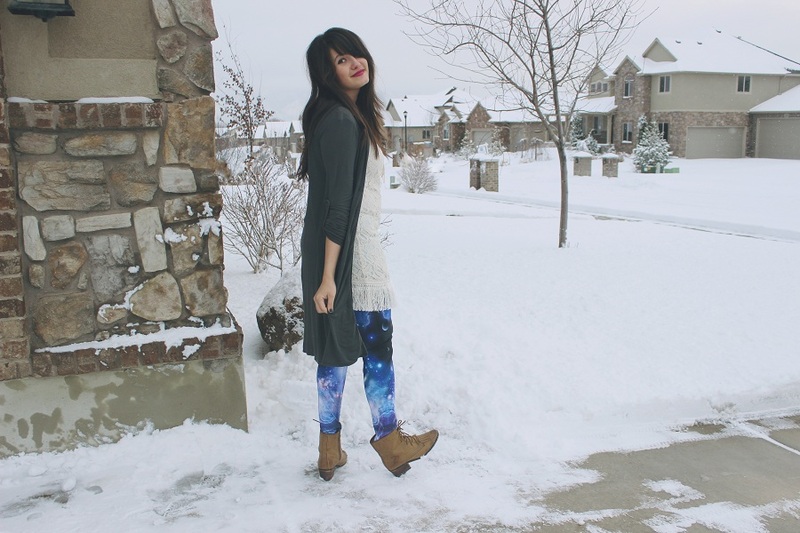 those leggings are out of this world :) I really do love them! super cute! You look great! Loved this look. Your necklace is quite the statement piece! You look adorable, I can only imagine how difficult it is to blog with a little baby around! You go girl! I too love leggings but only with a shirt that is long enough to cover my bottom! I just purchase my very galaxy print piece of clothing the other day and can't wait til it arrives (I'm a bit late to the party!) Hope you're having a wonderful day! 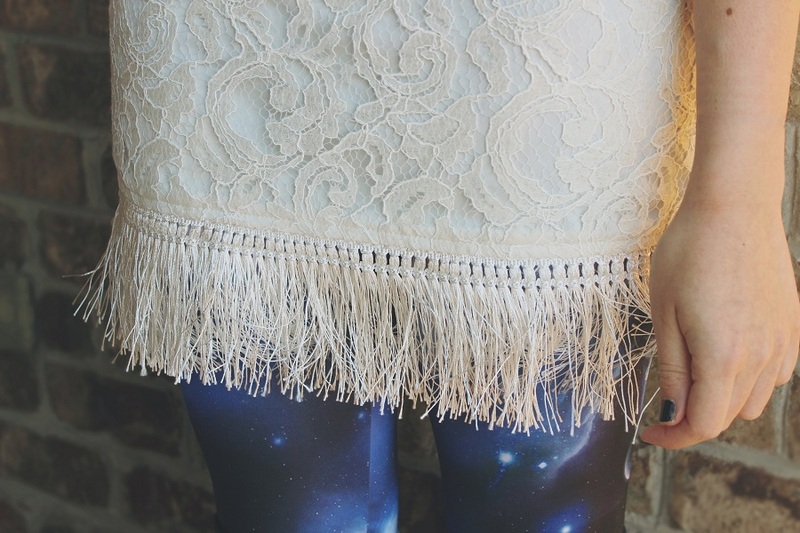 Those leggings are so fun! And I really like that necklace!